Not all wags are created equal. In fact, your dog's tail can offer several clues about his mood and emotional state. Want to know what tale that tail is telling? 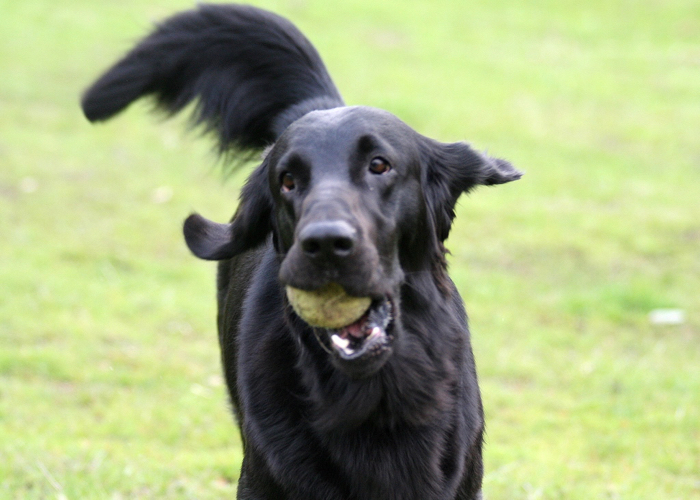 Read on to discover what secrets your pup's wag is holding. We've asked Danielle McMullen, a professional dog trainer with more than 10 years of experience and owner of Aces Dog Training in Las Vegas, NV, what's up with the wag of your pooch's tail. Q. What are some signs that the wag is a happy one? A: There are three wags predominantly associated with affable, happy-go-lucky dogs that come to mind. The full-body wag where the whole body wiggles with the wag, a wag coined the "helicopter tail, "where the tail wags in fast circular motions and, lastly, a wag with broad fan like motions with the dog in a play bow position. Q. Can the direction of your dog's tail wag — right or left — tell you more about what your pooch is feeling? A: Believe it or not, yes! Scientists in Italy discovered that a dog's tail positioning tended to favor the dog's right side when they were happy and favored the left when feeling threatened and or anxious. It is important to note that they are referring to the right and left as the dog's right and left viewed from the rear as if facing in the direction the dog is viewing. Q. What kinds of things can my pup's wagging tail actually tell me? A: A tail wag can be an indication of happiness, fear, insecurity and can even be a warning . I urge people to remember that while the height, speed and position of a dog's tail can serve as a general indication of intention and the pup's level of comfort, people should not solely judge how safe interacting with a strange dog is based on feedback from the tail alone, and individual norms need to be accounted for. Dogs use lots of ways to communicate their level of comfort, the tail is merely one component to consider. Q. If I'm unsure of what the tail is telling me, what other signs should I look for to indicate how my dog is feeling? A: Be cognizant of the dog's overall body posture, eyes, facial expression, ear positioning, hair/fur, vocalizations and watch for classic signs of stress like lip licking and excessive panting. Q. What are the main things I should look at when trying to decode my pup's tail wag? A: When analyzing the function of a dog's tail wag, I recommend attention be directed to the position (height), speed, and overall breadth of the movement of the tail. Q. What does the speed of the wag — slow or fast — mean? Q. What does my dog's tail height — high or low — indicate about his mood when he wags it? A: A tail held high is typically indicative of the dog being alert with heightened arousal levels, whereas a tail held low or between the legs by and large is evidence of a more insecure, nervous pooch. Tail height at either extreme of the spectrum should be taken as a signal to avoid interaction until Lassie calms down. Have questions about your canine's behavior? Leave us a comment below! Photo Credit #1: "Yo quiero la playa!" by moonjazz via Flickr. License info. Photo Credit #2: "Shows over" by Gina Spadafori via Flickr. License info.